The Punch and Die Grinder (PDG), a Rotary Table Surface Grinder, is primarily dedicated to the sharpening of turret press tooling, but also includes the sharpening of rooftop punches and small progressive die details. 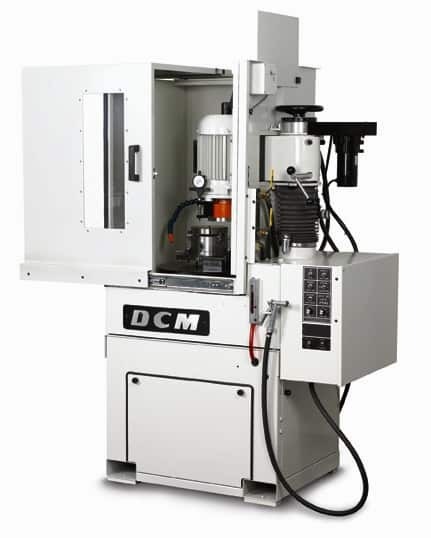 DCM Tech’s Punch and Die Grinder is a turnkey package with autofeed control, self dressing CBN abrasives, through spindle coolant and universal fixturing that accepts Amada, Trumpf, Salvagnini, Finnpower, Weideman, Whitney, and other style tooling. Sharpen large station dies and rooftop/shear angle tooling up to 10 degrees with the standard fixturing package. Typical grind time is less than 5 minutes.